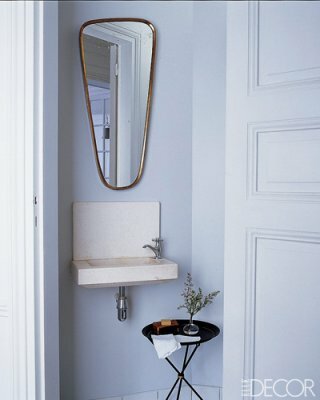 a tiny nook, yet the mirror and small table bring a beautiful elegance to it..
Ferragamo, and I wouldn’t expect anything less…. 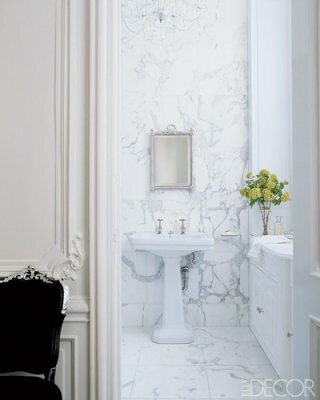 Obviously a large space that a vanity of this caliber can be floated in the room….and I love it because it’s different. That style sink again…I’m hooked. 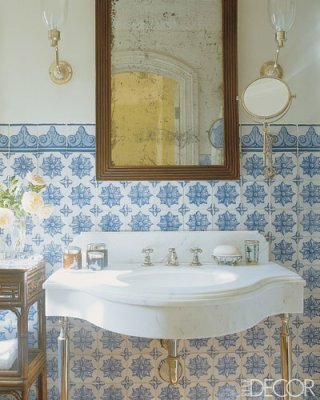 Blue and white tiling keeps it crisp, while the antique mirror brings warmth. Sweet on the idea of lining art along the counter. I’m going to have to work this into the House of Deva. 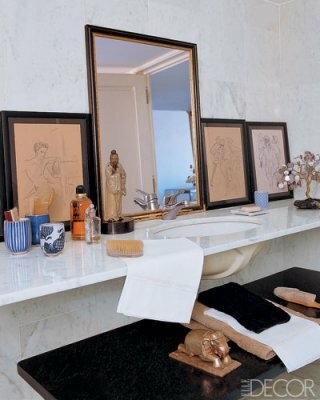 I find this space balance really nice with male and female decor elements. 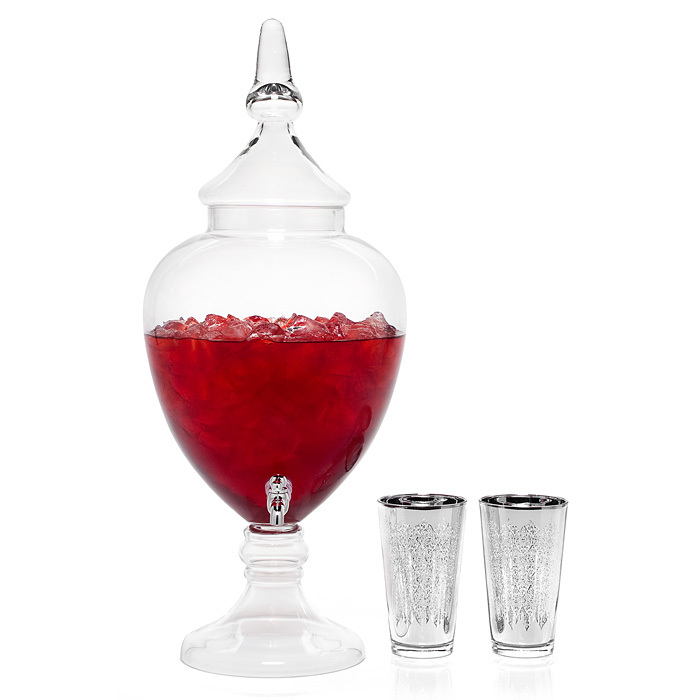 Sometimes we have to pamper ourselves…and Z Gallerie has some delightful treats on sale…. Our humble home is under a constant state of evolving design. Since I was a tiny one I’ve always adored re-arranging furniture and switching up the decor. I inherited this attribute from my sweet mama, who was consistantly moving anything that wasn’t nailed down…and still is… probably as I type this. We’ve lived in quite a few homes and the array of items aquired over the years are quite ecletic, but lately I’ve been on a wood kick, and I find the neautral canvas they provide for the rest of our decor lovely unsurpassed by anything we’ve brought together before. 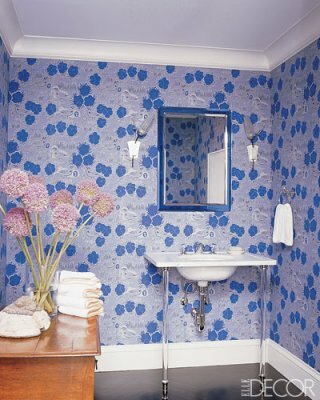 A blue glass vintage wine jug placed upon a wooden dresser brings the colors of sand and ocean in. A weathered mirror over the fireplace softens the hard lines and darkness that comes when a fire is not burning. I’m sure you catch the jest. So when I received my Elle Decor, December 2010/January 2011 I was immediately taken with the cover and featured home…below are just a few highlights…. The white slipcovered dining chairs pop from this rustic dining room, while the bookcases provide visual interest without overloading the senses. Loving both the stone fireplace and dining chairs here. Looks like the perfect spot for wine and cheese, which they have all ready for us at the table, which I also love. Completely entraced whenever an Italian campaign bed appears. I find the simple lines elegant and this room completely sets the mood for cozy rest. One word. STUNNING. The silver tub is a showstopper with the sunlight coming through the windows. Completely warm and inviting. I’m all for darker rooms. With adequate windows, as this one clearly has, I think they cocoon ones living in a sense of warmth and comfort. 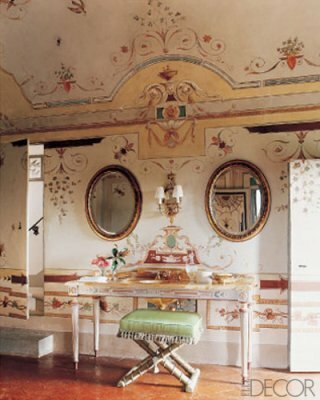 The ceiling in this room, as simple as it might seem is beautiful showing off range of tones that make the room glow. Dottings of orange shaded highlights in the throws (Hermes), books and flowers play wonderful with it.